Faced with the imminent depletion of the Highway Trust Fund, which is expected to exhaust its resources by August, President Obama has repeatedly urged Congress to pass legislation for increased infrastructure funding. Without congressional action, the Federal Highway Administration will not be able to maintain its same-day payments to reimburse states for infrastructure projects. According to the President, this scenario would put nearly 700,000 jobs at risk. Job losses are not the only impact of underinvestment in infrastructure. America's aging highways, bridges, and transit systems directly affect businesses, undermining productivity and competitiveness. Likewise, a deficient infrastructure threatens the safety and well being of the American population. The present article will discuss the critical situation of U.S. surface transportation infrastructure and the role of innovation in bridging the existing investment gap. It will further present the federal R&D tax credit opportunity available for companies engaged in infrastructure innovation. The World Economic Forum's Global Competitiveness Report for 2012-2013 ranked U.S. infrastructure as 14th in the world, seven slots lower than where it was in 2008. This considerable change can be explained by the country's aging infrastructure, which calls for urgent investments and upgrading efforts. 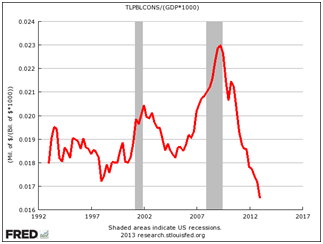 The chart bellow demonstrates the historic low spending on public construction as a percentage of GDP - lower than it has been in more than two decades. American infrastructure earned a score of D+ in the American Society of Civil Engineers (ASCE) report card. On January 2013, the organization published the Failure to Act economic report , which assesses the consequences of continued underinvestment in infrastructure as well as the economic opportunity of filling the existing investment gap. The ASCE estimates that, if current trends persist, cumulative infrastructure investment needs will reach $2.7 trillion by 2020, and $10 trillion by 2040. It is expected that funding will be available to cover only 60% (or $1.7 trillion) of such needs by 2020, and 53% of them by 2040. 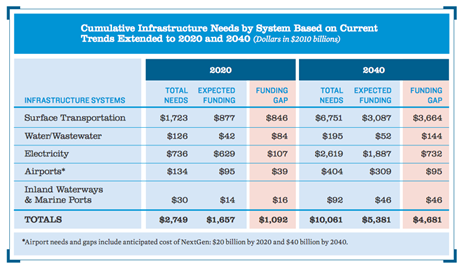 As a result, the projected infrastructure gap will total $1.1 trillion by 2020 and $4.7 trillion two decades later. The estimated infrastructure needs will be predominantly generated by surface transportation systems, such as roads and bridges, as shown in the table below. Source: American Society of Civil Engineers, Failure to Act Report, 2013. In addition to threatening safety and well being, degrading infrastructure generates unquestionable inefficiencies and, consequently, higher costs to businesses and households. The result is a scenario of higher prices for both national and imported goods, fewer jobs, and lower incomes. The ASCE estimates that, if current trends are not reversed, the costs of deficient infrastructure to businesses and households will total $1.8 trillion by 2020. This burden would have major impacts on productivity, competitiveness, innovation, and consumer spending. From a macroeconomic perspective it is safe to say that the infrastructure gap would severely compromise long-term economic development. 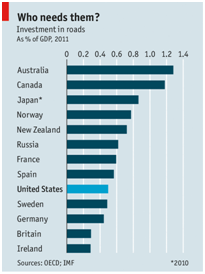 An aggregated loss of $3.1 trillion in U.S. GDP, almost the equivalent of Germany's entire GDP. A $1.1 trillion loss in U.S. trade value, equivalent to Mexico's GDP. A $2.4 trillion drop in consumer spending, comparable to Brazil's GDP. An average loss of $3,100 in annual personal disposable income. The condition of surface transportation infrastructure is key to the economic vitality of every country. Highways, bridges, railroads, and transit systems are even more critical in territories of continental proportions, such as the United States. Even though America is one of the most car-dependent nations in the world, its investment in roads is far behind the one of many other countries, as portrayed in the chart bellow. America has witnessed the deterioration of its surface transportation infrastructure, which becomes dangerously outdated year after year. Though funding has often sufficed to avoid the collapse of key facilities, the economic impacts of such a continued deterioration cannot be denied. Deficient infrastructure is particularly critical in the largest concentrations of urban areas, where intense commuting patterns place a strain on transportation capacities. In 2010, congestion caused the loss of 630 million vehicle hours traveled. Unless a much-needed reform takes place, this number is expected to reach 1.8 billion hours in 2020. Productivity losses, higher operating costs for vehicles, decreased reliability, and bigger expenses with environmental and safety concerns are just a few examples of how deficient surface infrastructure will affect the country's economic performance. According to the ASCE, by 2020, the country's projected surface transportation deficiencies will cost the national economy cumulatively around $900 billion in GDP. In response to the critical scenario described above, a growing number of universities and research centers are engaging in infrastructure R&D. Their efforts speak to the importance of this line of research and set the basis for innovation from the private sector. The following table features a sample of ongoing efforts. With focus on modern building materials, the Department of Civil Engineering and Engineering Mechanics at Columbia University is engaged in the development of smart materials that can change their properties in response to external conditions and enhanced materials, such as high-strength steel alloys and non-corrosive steels. Research in infrastructure delivery and management has led to advancements in multi-hazard risk analysis of infrastructure systems; bridge management systems; operations research applications in infrastructure management; among others. Founded in 2008, the Zofnass Program for Sustainable Infrastructure at the Harvard University Graduate School of Design aims to develop and promote methods, processes, and tools that quantify sustainability for infrastructure. The Program has created the Envision, which establishes a rating system for infrastructure projects. With the objective of improving the effectiveness of national infrastructure, MIT Engineering Systems Division adopts an interdisciplinary approach to critical infrastructure research, contemplating both technical and social complexities. Research projects include the development of new, powerful accident causality models and risk management techniques that can handle the complexity of today's technical and social systems. Researchers are constructing advanced computational models to provide information on potential risks of safety-critical infrastructure. With more than $40 million in annual sponsored program research, the Virginia Tech Transportation Institute (VTTI) aims to advance transportation through innovation. The National Surface Transportation Safety Center for Excellence at VTTI evaluates the built roadway environment and carries out a variety of projects, such as the assessment of emerging active and adaptive roadway delineation systems. Similarly, the Connected Vehicle/Infrastructure University Transportation Center develops innovative solutions to enable the sharing of real-time information across vehicles and infrastructure elements. Among the various cutting-edge projects is the development of connected vehicles enabled with sensors capable of measuring pavement conditions. Dedicated to innovation in highway and traffic engineering. Ongoing research focuses on pavement, cements, and experimental materials. Projects include the implementation of curing, texturing, subbase, and compaction measurement alternatives for continuously reinforced concrete pavement, the development of guidelines for repairing severe edge failures, the evaluation of binder aging and its influence in the aging of hot mix asphalt (HMA) concrete, and the use of recycled asphalt shingles in HMA. Innovation plays a crucial role in bridging the existing gap in infrastructure investments. The following sections will present innovative solutions that promote efficiencies, reduce risks, accelerate delivery schedules, and cut costs of infrastructure projects involving bridges, highways, and tunnels. In October 2013, an Associated Press report revealed that, of the 607,380 bridges listed in the U.S. National Bridge Inventory, 65,605 are classified as "structurally deficient" and 20,808 as "fracture critical". Of those, 7,795 present a combination of the two red flags, which, according to experts, indicates a significant disrepair and a risk of collapse. The structurally deficient and fracture critical bridges carry more than 29 million drivers a day. The Federal Highway Administration (FHWA) estimates that in order to eliminate the country's bridge deficient backlog by 2028, we would need to invest $20.5 billion annually. Nevertheless, only $12.8 billion is currently being spent. Insufficient funding underlines the importance of creating innovative solutions that will either help extend the lifespan of existing bridges or enable the construction of safer and more durable new ones. Prefabricated Bridge Elements and Systems (PBES) are structural components of a bridge that are built offsite, or adjacent to the alignment. Compared to conventional construction methods, PBES reduce onsite construction time and mobility impact time. Slide-In Bridge Construction is a cost-effective technique for deploying PBES, or quickly replacing an existing bridge. A new bridge is built on temporary supports parallel to an existing bridge. Once construction is complete, the road is closed and the existing bridge structure is demolished or slid out of the way. The new bridge is slid into place, tied into the approaches and paved within 48 to 72 hours. Geosynthetic Reinforced Soil - Integrated Bridge System (GRS-IBS) is a construction method combining closely spaced geosynthetic reinforcement and granular soils into a new composite material. The method is used to construct abutments and approach embankments that are less likely to settle and create a bump at the end of the bridge. The GRS-IBS is easy to build and maintain and 25 to 60 percent more cost-effective than conventional construction methods. These innovative methods enhance motorist and worker safety throughout bridge construction, lessen the environmental footprint involved, and constitute an alternative for climate-controlled and environmentally sensitive areas. The preservation of existing bridges is also an important field for innovation. The FHWA recently published a Bridge Preservation Guide in which it urges state DOTs to strategically manage their bridge assets in order to maximize their lifespans. The accurate monitoring of bridges' conditions is a crucial aspect for preservation. To this end, innovative, sensor-enabled systems can provide objective, actionable information to support decisions involving structural maintenance, repair, or replacement. Based in Alpharetta, GA, Lifespan Technologies has developed award-winning structural monitoring solutions. The company's patented, multi-use PeakStrain sensor can capture data on displacement/strain, crack growth/propagation, confirmation of bearing operation, and relative movement (out-of-plane bending). Lifespan Technologies' solution offers high performance 24x7 remote monitoring of bridge conditions and helps asset owners cost-effectively manage their infrastructure. By using passive sensors that work without power, PeakStrain constitutes an interesting alternative for long-term monitoring. In addition to being re-usable, the sensors are designed for harsh, outdoor environments. The U.S. highway system is currently faced with daunting challenges - accommodating more traffic and higher loadings; reducing traffic disruptions during construction; meeting more stringent environmental, community, and safety requirements; and continuing pressure to reduce costs. Addressing such challenges require a continued commitment to innovation. Examples of innovation in highway design include simple yet ingenious solutions, such as the concept of glowing lines, which consists in using luminous paint that glows for up to ten hours through the night enhancing safety in remote, non-illuminated roads. Paint can also be used to warn drivers about the condition of road surface. Temperature sensitive paint can feature snowflake symbols when it drops bellow freezing. The use of sensor-enabled systems is also a promising field for highway innovation. Interactive lighting systems can save power by detecting cars as they approach and switching on the lights up the road. Highway weather sensors provide highly accurate, real-time information on pavement temperature, amount of chemical, and surface friction or grip, enabling informed decision-making and enhanced safety for drivers. Sensors can also be used to monitor surface quality, detecting anomalies, such as potholes and speed bumps. Cutting-edge technologies have also enabled faster, more accurate, and more efficient highway projects. Three-dimensional (3D) modeling, for instance, provides geospatial visualization of intricate design, offering 3D viewing from multiple perspectives. It further enables the running of simulations prior to construction aimed at detecting potential flaws. Smart 3D models can also communicate with GPS machine control that guides and directs construction equipment, enabling workers to use the most up-to-date models even if unexpected changes are made. This kind of GPS control favors first-pass accuracy, reducing waste and avoiding the misuse of resources due to human error. It also allows the automation of manual tasks, such as staking, stringing lines, drawing fill lines, and setting grade stakes. The transfer and use of 3D model data in GPS machine control equipment can increase productivity by up to 50% for some operations, reducing idle time of equipment and cutting associated green house gas emissions by around 40%. Based in Exton, PA, software company Bentley systems is the creator the OpenRoads technology, which integrates industry-leading innovations such as immersive modeling, design-time visualization, design intent capture and persistence, hypermodeling, information mobility across engineering disciplines and project phases, and construction-driven engineering. When it comes to increasing the durability of roads, it is critical to avoid the premature cracking and crumbling of pavement. Innovative intelligent compaction (IC) rollers have greatly contributed to improving the quality, uniformity, and long-lasting performance of pavements. Such vibratory rollers are equipped with control systems that collect, process, and analyze compaction data in real time, allowing operators to monitor and perform eventual corrections to the compaction process. In comparison with traditional static rollers, IC ones can compact greater amounts of pavement with fewer passes and in shorter periods of time, yielding cost and fuel savings. IC rollers use advanced technology to produce the intelligent compaction measurement value (IC-MV), which helps identify problem areas in the pavement and avoid under or over rolling it. Working in partnership with the Transtec Group, the Federal Highway Administration and the Minnesota DOT developed the Veda software, which allows project personnel to view and analyze geospatial data from various IC machines. The innovative application features easy-to-ready compaction data in the form of graphics and maps. Pavement-related innovation can also contribute for safer driving, particularly in critical locations, such as curves and intersections. High friction surface (HFS) treatment is an emerging technology that consists in applying high-quality aggregate to potentially high-crash areas to increase friction beyond conventional pavement and enable drivers to maintain better control both in dry and wet conditions. Though a variety of HFS products are currently available at the market, R&D efforts are underway to develop more cost-effective solutions. Materials is yet another blooming field for innovation in highway construction. A recent research by the Carbon Trust and the British building materials company Lafarge Tarmac found that low temperature asphalt (LTA) constitutes a viable alternative to conventional asphalt used on roads. Through an innovative method that bounds together aggregates and bitumen at lower temperatures than usual, this alternative uses considerably less energy, saving money and reducing emissions. The use of recycled materials, particularly reclaimed asphalt pavement (RAP), has also contributed to increasing efficiency and sustainability of highways. RAP consists of existing asphalt pavement materials removed during resurfacing, rehabilitation, or reconstruction operations. With increasing proportions of RAP being used in asphalt production, ongoing research aims at improving the techniques to obtain, store, and process RAP in order to maintain its quality and at improve long-term mixture performance. The U.S. Federal Highway Administration encourages innovation in highway construction projects and, to that end, has established a contracting tool called Alternative Technical Concepts (ATCs). The objective of this mechanism is to harness the expertise of construction contractors to incorporate efficiencies, reduce risks, accelerate schedules, and cut project costs. The ATC consists of a request by a proposer to modify a contract requirement and the subsequent presentation of a solution that is equal to or better than the one originally featured in the invitation for bid or the request for proposal document. Develop standards, guidance, and best practices for roadway tunnels, particularly with regards to design criteria for performance-based construction specifications; extreme events and tunnel security; vertical clearance, horizontal clearance, and sight distance; tunnel design life and future maintenance for structural, mechanical, electrical, and electronic systems; and fire and life-safety systems. Develop an emergency response system plan unique to each facility that takes into account human behavior, facility ventilation, and fire mitigation. Develop and share inspection practices among tunnel owners. Consider inspection and maintenance operations during the design stage. Develop site-specific plans for the safe and efficient operation of roadway tunnels. Develop an operational financial plan that addresses the need for future preventive maintenance, system upgrades and replacements, and operator training and retention. Recent innovation in tunnel construction includes methods to accelerate construction time, particularly through the use of prefabricated elements, such as steel and precast concrete submersed tubes, prefinished manufactured steel ceiling panels, precast concrete floors, and precast concrete ceiling panels with tiles. When it comes to improving tunnel operations, the importance of lighting cannot be understated. Obstruction of daytime illumination causes a significant loss in driver visibility, what calls for reliable and efficient lighting systems. Innovative lighting technologies have enabled the control of luminosity levels and prevented the "tunnel effect". Recent efforts have focused on new, highly efficient LED solutions, which constitute an energy-saving, sustainable, and durable alternative for tunnels. Infrastructure can also be the basis for further innovation in tunnel management. Recently created innovative systems have transformed light fixtures into networked, sensor-equipped, solid-state, smart devices capable of capturing and transmitting sensory data about the surrounding environment. Such systems make each fixture a node in a broadband network, which can be used for a wide range of applications. Humidity and CO2 levels, temperature, luminosity, and traffic conditions are a few examples of conditions that can be monitored by sensor-enabled systems. Innovative efforts have also focused on preventing water leakage in tunnels. Vacuum injection of water seepage cracks and membrane-based waterproofing systems are examples of effective technologies in this domain. BASF has developed the innovative Masterseal 345, a sprayable membrane that offers efficient and reliable waterproofing for tunnels. The traditional method for tunnel waterproofing consists of a multilayer system (shotcrete, a geotextile drainage layer, a sheet membrane, and another layer of concrete), which takes up considerable space. Conversely, BASF's solution is a monolithic structure, consisting only of a layer of shotcrete, a Masterseal 345 membrane, and another layer of concrete. In addition to being thinner and more durable, it enables waterproof refurbishment of tunnels with just 5 cm extra lining thickness and seals easily any geometry. Throughout the U.S., a growing number of tunnels are adopting innovative technologies to ensure cost-efficiency, durability, and safety. Colorado's Hanging Lake Tunnel (HLT) on I-70 at the midpoint of Glenwood Canyon has been considered by the FHWA as one of the country's most technologically advanced tunnel systems. It features a traffic control and information center that monitors each vehicle traveling through the tunnel via a complex system of sensors and closed circuit television cameras. Headquartered in New York, the multinational engineering and design firm Parsons Brinckerhoff (PB) has been at the forefront of tunnel innovation. Recent areas of research include the development and application of state-of-the-art designs and cutting-edge technologies in areas such as tunnel security and blast-protective design, tunnel construction engineering, tunnel inspection and rehabilitation, risk analysis and management, virtual design and construction, and sustainability and green design. PB recently received the International Tunneling and Underground Space Award for Innovative Use of Building Information Modeling (BIM)/Design Software. The company has engaged in groundbreaking 4D modeling, which consists in the intelligent linking of individual 3D computer aided design (CAD) components or assemblies with time- or schedule-related information. Continued underinvestment in America's aging infrastructure is expected to have major economic impacts, causing job losses and undermining overall productivity. Innovation in processes, design, materials, and monitoring technologies will play a crucial role in closing the widening gap in infrastructure capabilities. Companies engaged in developing new and improved solutions for highways, bridges, and tunnels should take advantage of federal R&D tax credits.